North America Forum»Forum ›League of Angels ›General Discussion › Godless or Lapsed Eragon? I have now finally formed my dream team of FW, MW, GP, MoD with my GW as backup. The team is performing well and I don;t see any real reason to change it just now. However, I am always looking for ways to improve and play a stronger game. Though looking a the Lapsed Eragon - It occurs to me as just like the GW, only stronger? Could anyone;comment on the relative strength of the two? It is worth the effort to get the SDL & the Lapsed crests? Well, many of the top players in the latest Champion Showdown had Lapsed Eragon in their lineup, if that tells you anything. think of Lapsed as Godless on steroids. that tells you pretty much everything, like xeph said, everyone on the showdown had him in party. Well Lapsed is like godless but an upgrade... so why not? is it worth for 5 certs? ;;;; is it worth for 5 certs? 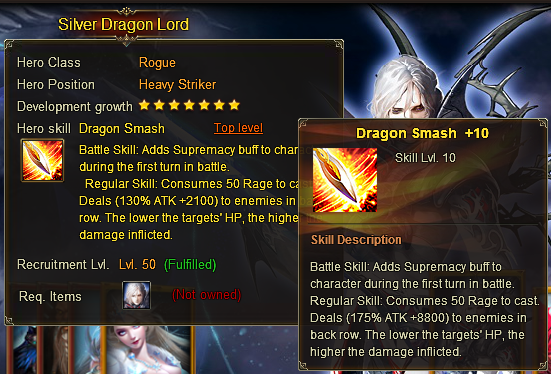 As damage output per skill cast SDL is under GW (SDL Skill level max is +10, GW is +13) but it need only half of rage to cast and he do not take any damage in first round. Even is not Leapsed as you thought in first place i still vote for SDL against GW since +13 is hard to get and even if your IRB get wiped out in a fight he will still cast skill every 2 turns, maybe every turn sometimes if you use as 3rd skill on your main Dragon fury and lucky enaugh to release it. Lapsed Eragon is way higher damage output than GW and GW skill only goes to +7 where did you get +13 from? LE is much better than GW in every aspect, so it\'s a no brainer to go with him instead of GW if you have the option to do so. 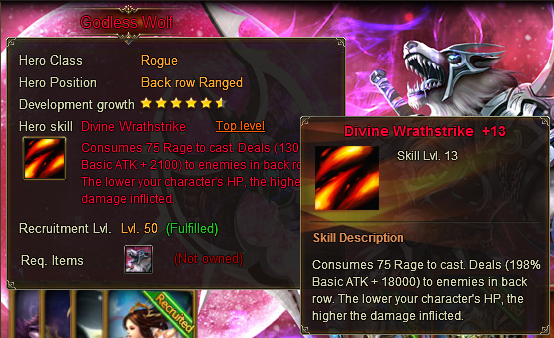 he mean the active skill , GW as almost every evolve heroe can go up to +13 .While SDL as being a basic heroe +10 . But you are right , SDL dmg is above GW , special because those passive which GW passive attack go to +7 and SDL +10 . The Supremacy and; those passive make a bigg difference . 2019-4-19 01:16 GMT+8 , Processed in 0.064388 second(s), 52 queries .